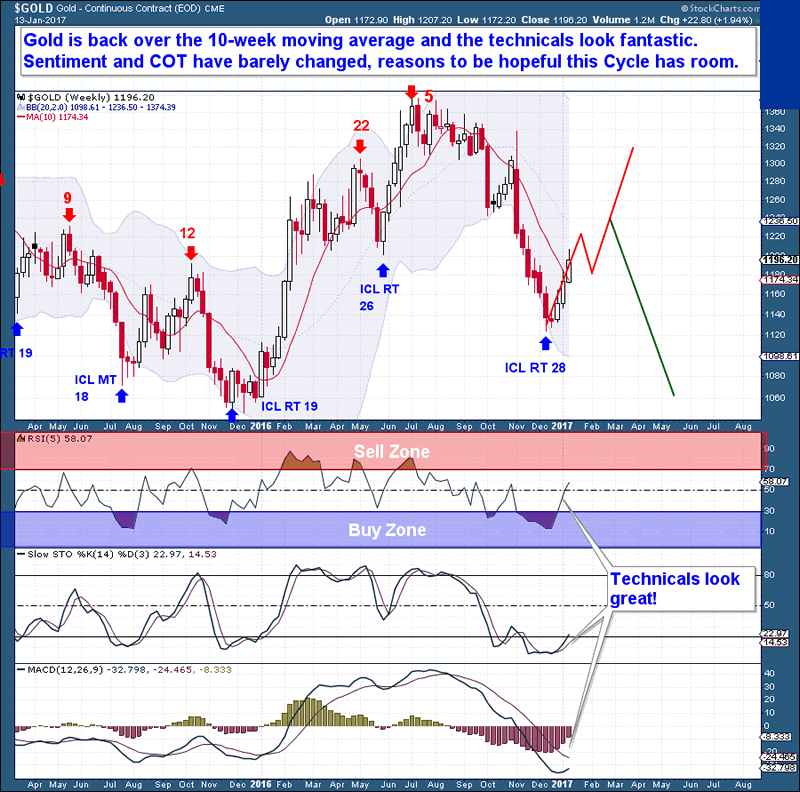 Back in December, I noted that there was not a Gold bull to be found (See post: Not a Gold Bull in Sight) and that the Gold Cycle was on the verge of a significant Cycle turn. Fast forward a month, and 20 days of this Daily Cycle (DC), gold is up almost $100 and has again caught the attention of gold bulls. Since the Cycle turn, this has been a rather interesting first Daily Cycle in gold. Mostly because the rally over the first twenty days has been fairly constant, with the half Cycle Low noticeably absent. Moreover, the move has not seen a surge based on a typical rush to cover short positions normally seen around the turn of any Investor Cycle. The last point might end up being more important than we think. Looking at this week’s commitment of trader’s report (COT), I’ve noticed that speculative Long and Short positions have barely turned off their recent extremes. Meaning that this $90 first DC move really has not come off the back of a shift in speculative positions. This is precisely why you do not see any large spikes in volume or price on any of the given 20 days of the Cycle. Therefore, from what I can tell, a larger degree rally lies potentially ahead for this Investor Cycle, setting the scene for an impressive 2nd Daily Cycle to come. When the gold Cycle first turned higher almost a month ago, I said that we could expect a $100 rally over the first 20 sessions. As it stands today, the Cycle has hit day 20 and rallied $90+ off the Cycle Low. It is at a point where we should check our short-term expectations going forward. 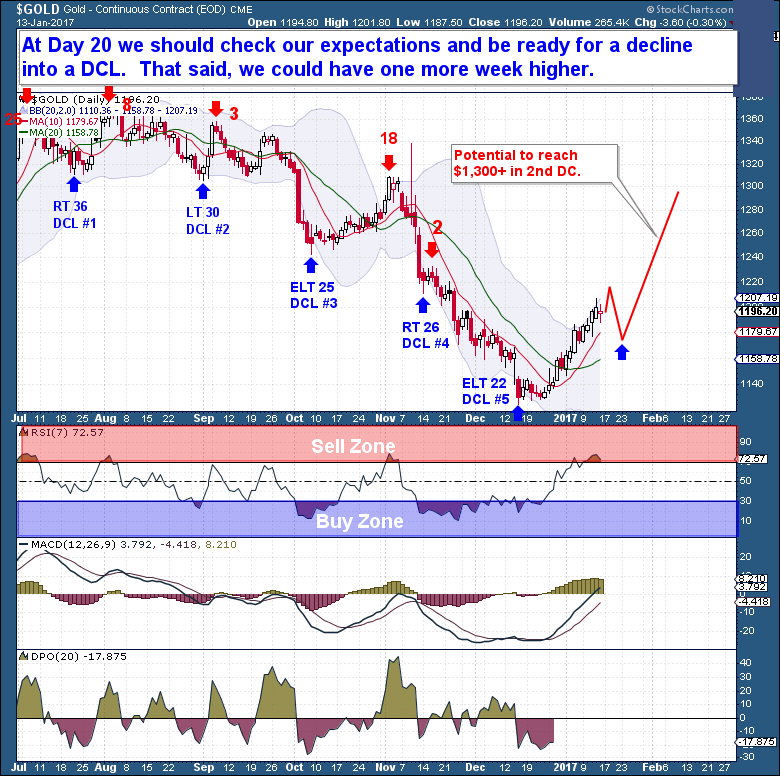 Although never ruling out another solid performing week ahead, it would also be consistent with past bullish patterns for gold to dip over the next week to form the DCL. 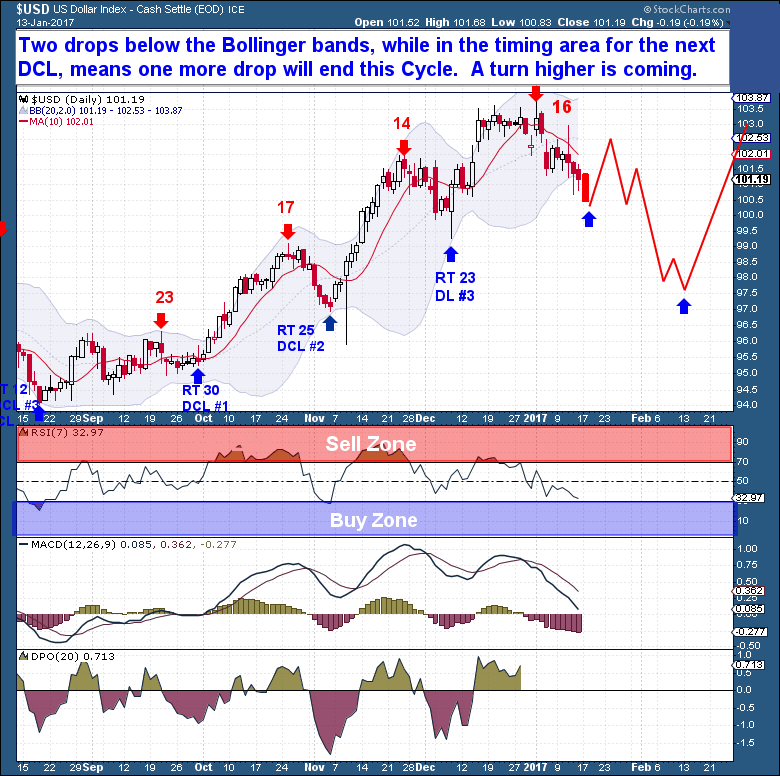 For the dollar, a big drop a week back on Day 18 of the Cycle was our confirmation that the decline had begun. Following through from that point, we now see the dollar at new lows on Day 26 today, further pushing below the Bollinger bands into deep (short-term) oversold territory. This is pretty much well beyond the normal Cycle Low timing band. Therefore, a turn higher is absolutely imminent, and a rally of at least 3-5 sessions is expected. Because gold is also near a natural Cycle topping point, the push higher by the dollar will only help to send gold lower at least temporarily. From that point, I do expect the dollar’s next Cycle to form Left Translated, opening up the possibility of a significant sell-off post the Trump inauguration, and a decline into the next major Weekly Cycle Low. As mentioned in the introduction, Sentiment and COT reports show very little change of late, even as gold begins to complete the initial thrust in this young Investor Cycle. With gold back over the 10-week moving average, and the technicals looking fantastic, all of my indicators here are in a significantly bullish alignment. Therefore, always appreciating that bear market rallies can be deceiving, I still believe there is plenty of room above for gold to allow for a significant rally. The Financial Tap publishes two member reports per week, a weekly premium report and a midweek market update report. The reports cover the movements and trading opportunities of the Gold, S&P, Oil, $USD, US Bond’s Cycles. Along with these reports, members enjoy access to a real-time portfolio with trade alerts. NOTE: It’s just $99 for a full 3 months of membership, a fraction of what one stopped out trade is likely to cost you. Consider joining The Financial Tap and receive two reports per week and the education you need to become a better trader or investor See >> SIGN UP PAGE!